Since the last CMS Bulletin, the CMS Physics Analysis Groups have completed more than 70 new analyses, many of which are based on the complete Run 1 dataset. In parallel the Snowmass whitepaper on projected discovery potential of CMS for HL-LHC has been completed, while the ECFA HL-LHC future physics studies has been summarised in a report and nine published benchmark analyses. Run 1 summary studies on b-tag and jet identification, quark-gluon discrimination and boosted topologies have been documented in BTV-13-001 and JME-13-002/005/006, respectively. The new tracking alignment and performance papers are being prepared for submission as well. The Higgs analysis group produced several new results including the search for ttH with H decaying to ZZ, WW, ττ+bb (HIG-13-019/020) where an excess of ~2.5σ is observed in the like-sign di-muon channel, and new searches for high-mass Higgs bosons (HIG-13-022). Search for invisible Higgs decays have also been performed both using the associated (HIG-13-018/028) and the VBF (HIG-13-013) production channels. A combined limit on the invisible decay branching fractions have been set to BR(H→invisible) of <52% (at 95% confidence level). The final Run 1 VH(bb) search, which sees a 2.1σ excess consistent with the SM Higgs boson has been submitted to a journal. The final Run 1 H(WW), H(ZZ), H(ττ) analyses have been approved and are in the final stages of preparing for journal submission. The SUS PAG continued harvesting the 8 TeV dataset in the search for “natural” SUSY. New results include searches for sbottom and stop by gluino-induced production by using the “razor” variable (SUS-13-004) and specific (1,2,3 leptons + b jet) topologies (SUS-13-007/013/08, respectively) as well as searches for gluinos decaying to top-pairs and neutralinos (SUS-13-016). The lower limits on the gluino mass have been pushed up to 1350 GeV at a 95% CL. A new series of searches with Higgs in the final state have started to appear, such as searches for stop pair production or electroweak partner pair production with Higgs bosons in the decay chain (SUS-13-014/017/021). Chargino and neutralinos masses are probed up to about 200 GeV in the latter search. The EXO PAG conducted other searches for new physics. Among them is an analysis looking for RPV gluino decays in three jets (EXO-12-049) giving a lower gluino mass limit of 650 GeV at a 95% CL and a new interpretation of the mono-lepton analysis (EXO-12-060) in terms of dark matter (EXO-13-004). The B2G group produced several new results with the full 8 TeV dataset. The B2G-13-001 analysis shows a combined search for tt resonances. When interpreted in specific models, for example the RS KK gluon, the lower mass limit is pushed up to M > 2.7 TeV at a 95% CL. The B2G-12-008 analysis searched for excited tops (and bottom squarks in an RPV scenario) excluding masses between 300 and 703 GeV (250 GeV and 326 GeV). In precision physics, the TOP group continued to confront NLO QCD calculations with measurements of the ttbb production cross-section at 8 TeV (TOP-13-010) and global event variables (TOP-12-042). 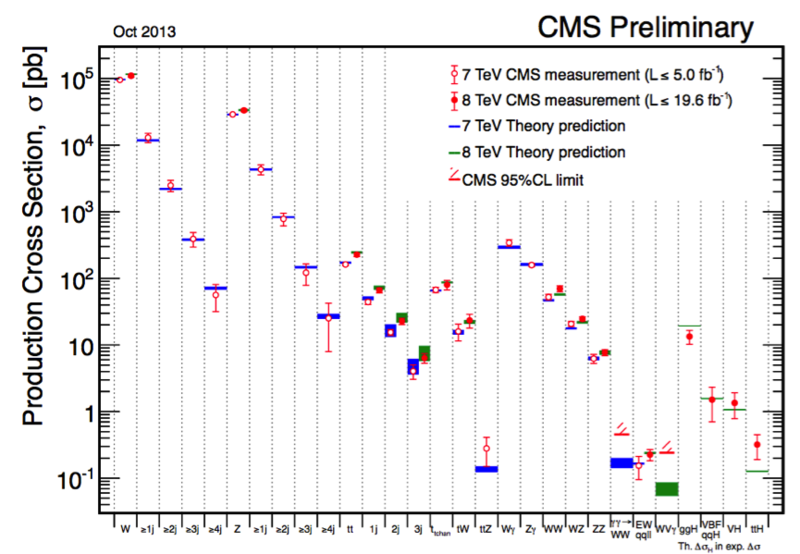 The CMS measurements of the top-quark mass have been combined to give the latest CMS value of 173.49 ± 0.36 (stat.) ± 0.91 (syst.) GeV (TOP-13-002). One of the highlights of EPS 2013 was the first observation of the tW single-top-quark production mechanism with a significance of 6σ (TOP-12-040). Derivations of the strong coupling constant up to the Q scale of 1.4 TeV has been performed through the measurements of the three-jet mass double differential distributions (SMP-12-027) and through the measurement of the inclusive jet cross-section (SMP-12-028). The latter analysis allows also to reduce the uncertainty on the gluon PDF with respect to the DIS-only derivation. The di-photon production differential cross-section has been measured and found to be in agreement with NNLO calculations (SMP-13-001). Figure 5: A grand summary of our Run 1 cross-section measurements, spanning over almost six orders of magnitude. One of the most prominent results of this year has been the first observation of the B0s→μμ decay by both the CMS (BPH-13-004) and the LHCb collaborations after a 25-year-long relay race of different facilities to establish this rare decay. The measured decay rate by the CMS experiment is (3.0 ± 1.0) x10–9. The combination with LHCb (BPH-13-007) gives a decay rate of (2.9 ± 0.7) x10–9, in good agreement with the SM predictions. Other results from the BPH group include the first ever measurement at a hadron collider of the cb2cb1 cross-section ratio (BPH-13-005) helping to shed light on the quarkonia production mechanism. The forward physics PAG (FSQ) has produced the first observation of pure electroweak production of a Z boson in association with forward/backward jets at 8 TeV (FSQ-12-035) presented at the SUSY 2013 conference. The HIN group continues to analyse data from PbPb runs at 2.76 TeV, pPb run at 5.02 TeV and high-statistics pp run at 2.76 TeV. Very interesting results have been presented at the Hard Probes 2013 conference, where the measurement of the nuclear modification factor in pPb (HIN-12-007) made a big impact. Other recent results from the HIN group include the comparison of photon-jet correlations in PbPb, pPb and pp events (HIN-13-006), and studies of inclusive jet, as well as Υ(ns) production in pPb and PbPb collision events (HIN-13-001/003).